This image was created by Monarch-Corona Printing Company in 2010. The company brilliantly copies the design of original cards, then adds new information on the back. 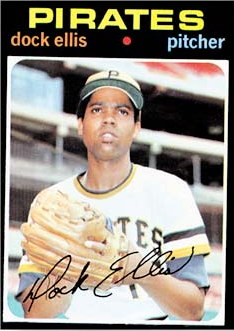 The Dock Ellis card is available directly from them. They did another series called the Legacy Series with Tim pictured, also available. Any lingering controversy over whether the Pittsburgh Pirates pitcher was telling the truth is largely dispelled in this article. 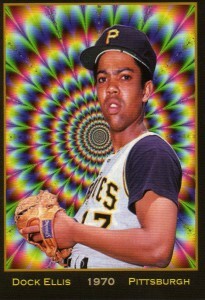 His colorful description of the experience of pitching a major league game while high on acid rings true. Hruby’s piece deals in part with the authenticity of Ellis’ claim that he was on LSD during what he called his “no-no,” which most people concede at this point, and secondly, whether there is any truth to Ellis’ claim that he got the acid from Timothy Leary himself. Dock Ellis in the dugout after pitching his no-hitter. 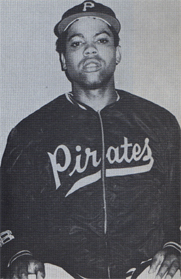 Photo from the book: Dock Ellis: In the Country of Baseball, by Donald Hall with Dock Ellis, 1976. Although it sounds like an experiment Tim would have loved to conduct, given his fascination with LSD, baseball, and experiential science, the fact is he was in prison during the 1970 baseball season, nor did he ever mention it to Michael, although they discussed Dock’s feat on several occasions. Dock might have been told the LSD originated with Tim, as the man and the drug were virtually synonymous back then, but there’s no evidence they ever met in person. Timothy Leary carried Dock Ellis' 1971 Topps baseball card, a gift from his archivist, Michael Horowitz, in his wallet. 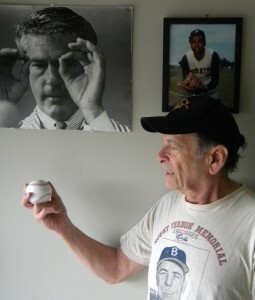 “Leary’s personal archivist, Michael Horowitz, said that the Leary-Ellis connection is highly unlikely — but that when Horowitz first heard about the no-hitter, he bought two copies of the pitcher’s 1971 Topps baseball card and gave one to Leary. “Tim proudly carried it in his wallet, and showed it to any fans of sports and psychedelics he ran into,” Horowitz said. Tim was a huge baseball fan from his childhood. 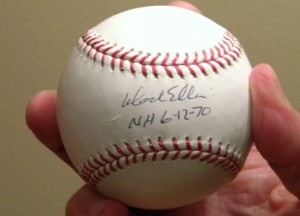 He played shortstop on his high school baseball team. Although he grew up in Massachusetts, he chose the Brooklyn Dodgers over the Boston Rex Sox and continued following his team when he settled to LA in 1977 after he was freed from prison. He had a close friendship with the recently retired Dodger catcher Johnny Roseboro, who brought him to the Dodger clubhouse on a few occasions, where Tim picked up autographed baseballs for his stepson, Zach, and his goddaughter, actress Winona Ryder. Michael Horowitz, contemplating a signed baseball commemorating the LSD no-hitter, under the gaze of Timothy Leary and Dock Ellis. Photo by Cindy Horowitz. Michael notes that, in Tim’s autobiography, Flashbacks, he describes how he once played a pick-up baseball game while on acid, in Zihuatanejo, Mexico, in the summer of 1962. He and his fellow Harvard researchers, and some of their graduate students, had gone there to establish a temporary “psychedelic summer camp,” where they could study LSD in a more natural setting away from the confines of Harvard. Here’s a 2-minute “performance” of the no-hitter by Robin Williams, who was good friends with Tim. They used to surf the net on Tim’s computer in the early days of the Internet. Here’s a link to an awesome animation by James Blagden, with live recordings of Dock Ellis himself describing the event. This entry was written by lisa, posted on September 10, 2012 at 8:40 am, filed under Articles, History, Michael Horowitz' Archives, Prison Years (1970-1976) and tagged baseball, dock ellis, Flashbacks, LSD. Bookmark the permalink. Follow any comments here with the RSS feed for this post. Post a comment or leave a trackback: Trackback URL.